The Church of the Brethren traces its roots back over 300 years to 1708 in Germany. The first congregation in America was at Germantown, PA, in 1723, but the denomination’s missionaries soon spread its beliefs elsewhere. The Brethren “mother church” on Lower Brummetts Creek was established in 1845 and was the fourth Protestant denomination to “play an important role in the religious life in the northern end of the county” according to Elizabeth Hunter in Voices of the Valley, her excellent history of Mitchell County’s first 150 years. The Church of the Brethren is one of 3 historic peace churches, alongside Mennonites and Quakers, which “espouse nonviolence and renounce war.” Another practice, which gained for the Church the nickname “Dunkards” is baptism by triune immersion, three times face-forward, in the name of the Father, Son, and Holy Ghost. Brethren churches also continue the practices of washing feet and anointing for healing. 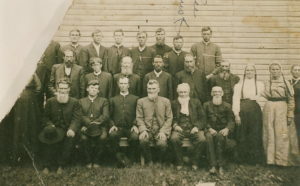 In 1913, when these photos of the annual conference were taken at Brummetts Creek, there were also Brethren Churches at Pleasant Grove (1894), Hollow Poplar (1902), Bailey (1912), and Pigeon Roost (1912). Seven Churches of the Brethren are currently listed in the in Mitchell County Church Directory; they include Bailey Independent Brethren, Berea, Lower Brummetts Creek, Peterson Chapel, Pigeon Roost Fundamental Church of the Brethren, Pleasant Grove, and Upper Brummetts Creek. Today, Churches of the Brethren in the Toe River Valley are part of the Southeastern District (SEDCOB), with administrative offices in Johnson City and 40 congregations throughout Alabama, Tennessee, North and South Carolina, and Virginia. SEDCOB’s website maintains that “Even though our churches are spread out geographically, we remain a closely-knit community of believers who aim to work simply, peacefully, and together to win over the world to Christ.” There are about 100,000 members of the Church of the Brethren. 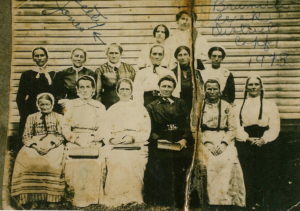 These two photographs, one of the men attending the 1913 conference at Lower Brummetts Creek and one of women, was provided by Faye Ellis Griffith. The Church of the Brethren continue to hold their annual conferences.